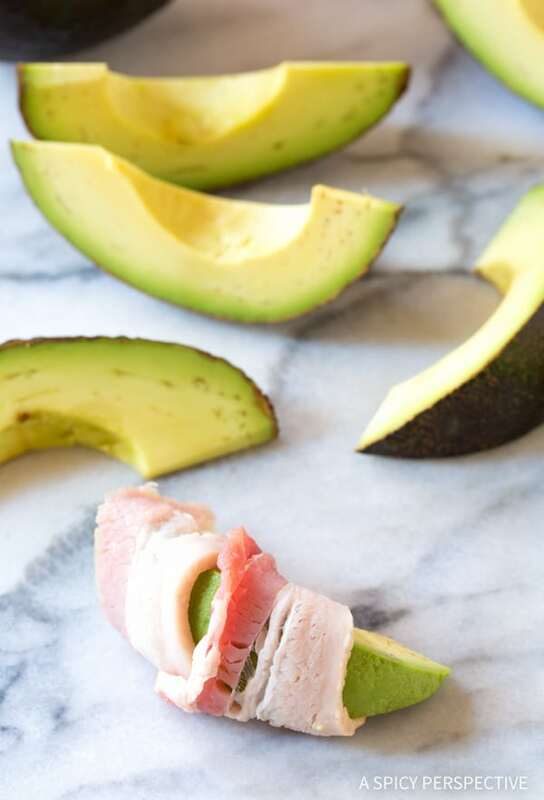 An easy low carb party snack with less than 5 ingredients… Bacon Wrapped Avocado will be the talk of the table this season! 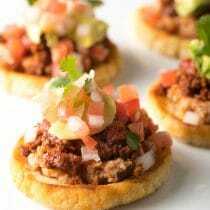 This week I wanted to share another comforting party snack you can enjoy with your friends at weekend gatherings and game days, that is gluten free, low carb, and paleo. 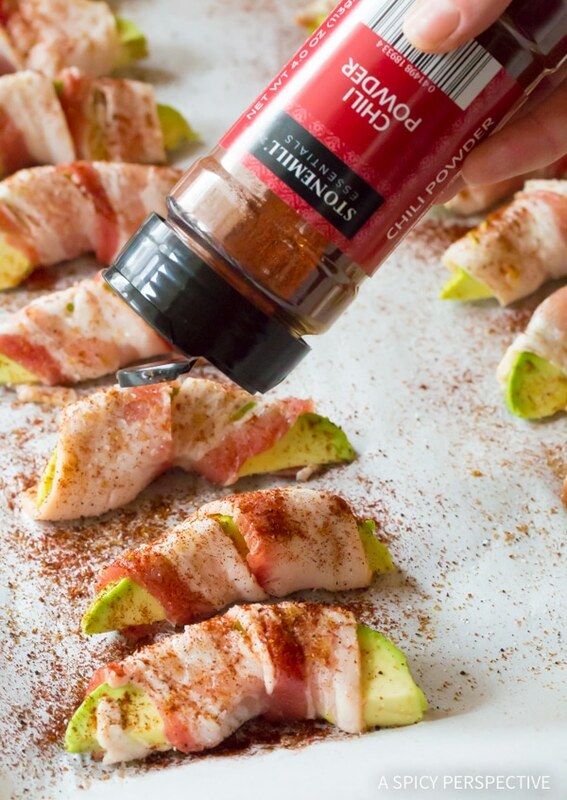 Bacon Wrapped Avocado slices might be the easiest homemade party snack ever. With only 2 main ingredients, and a little bit of seasoning, you can pop them in the oven in minutes. Then enjoy tantalizing crispy bacon pockets filled with soft creamy avocado. The first time I made Bacon Wrapped Avocado, I had a group of tweens at my house. They came sneaking into the kitchen after the scent of bacon started wafting from the oven. Even the pickiest child in the room, loved the Bacon Wrapped Avocado and snuck a few extra wedges before leaving the house, if that tells you anything. I knew I had a winner on my hands. 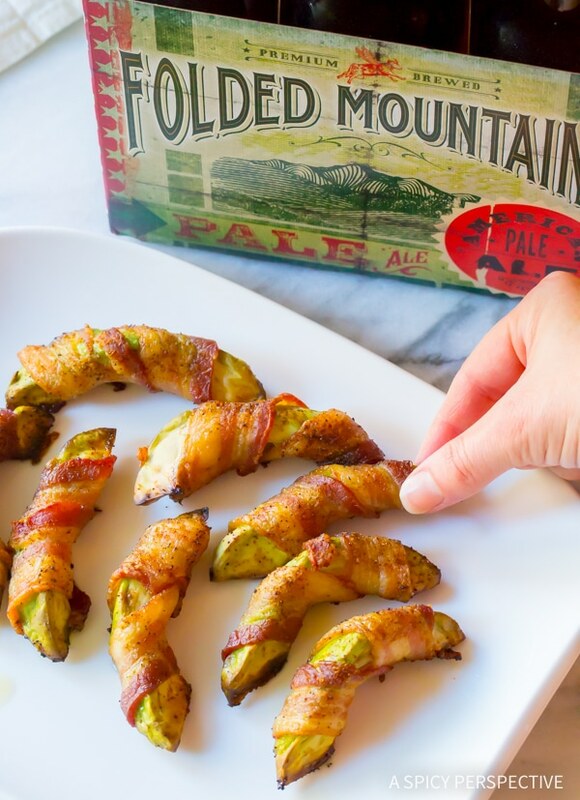 Bacon Wrapped Avocado might not be a snack you can get away with eating all day long, seven days a week. 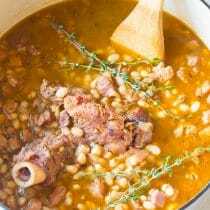 Yet when you are trying hard to keep the carbs on the down-low, and need something to satisfy junk food cravings, this is the dish to go with. Rich, crispy, and packed with flavor. Plus you can find everything you need at ALDI! When was the last time you visited ALDI? If it’s been over a week, it’s been too long. Every time I go, I discover something fabulous for a much better price than I could find it anywhere else. ALDI makes it their goal to cut out unnecessary costs in every area of there business in order to make sure we get the best products at the lowest possible price. ALDI focuses on offering the most popular foods and products for up to 50% off, and creating minimalistic shopping environments. The ALDI in-store brands are pretty darn impressive. ALDI continually taste tests their products against big national brands and only puts foods out in their stores if they are as good or better than the competition. They even offer a double guarantee that you will be happy with what you buy! From organic pantry snacks to fresh produce, I can vouch that I’ve never bought a grocery item at ALDI that wasn’t a pleasant surprise. I bought everything needed for my Bacon Wrapped Avocado at ALDI. Here’s my shopping list. Folded Mountain Pale Ale to wash them down! FYI – Simply Nature Sweet Potato Chips are truly the best store-bought sweet potato chips I’ve ever tried. 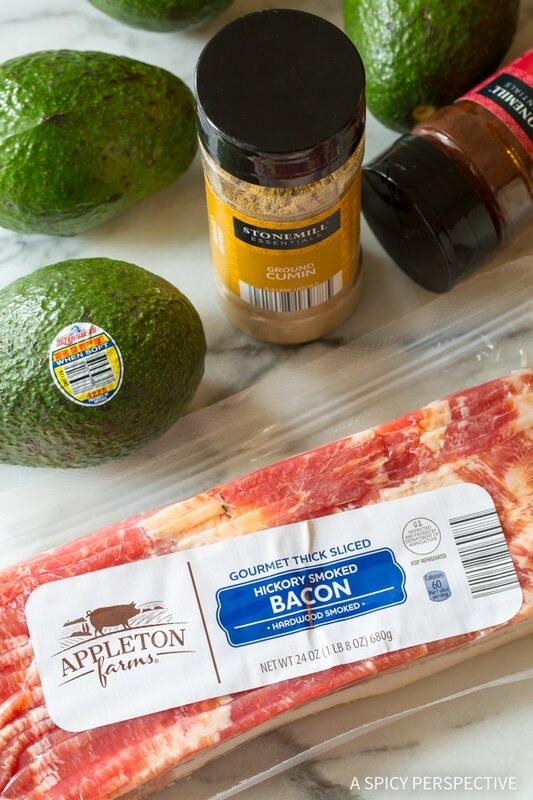 Now that you’ve got your shopping list, ready to make Bacon Wrapped Avocados? 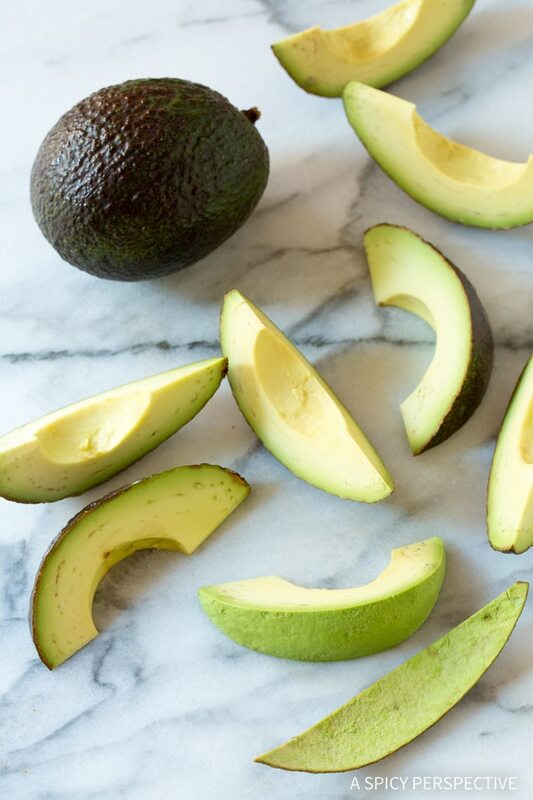 Simply slice firm avocados into wedges and peel off the skin. Stretch thick bacon strips to elongate them. Cut them in half. Then wrap half a bacon strip around each avocado wedge and tuck the ends under the bottom. Sprinkle the wedges with a little smoky chile powder and cumin, and even a little salt. Don’t go overboard on the salt, because bacon is already salty. 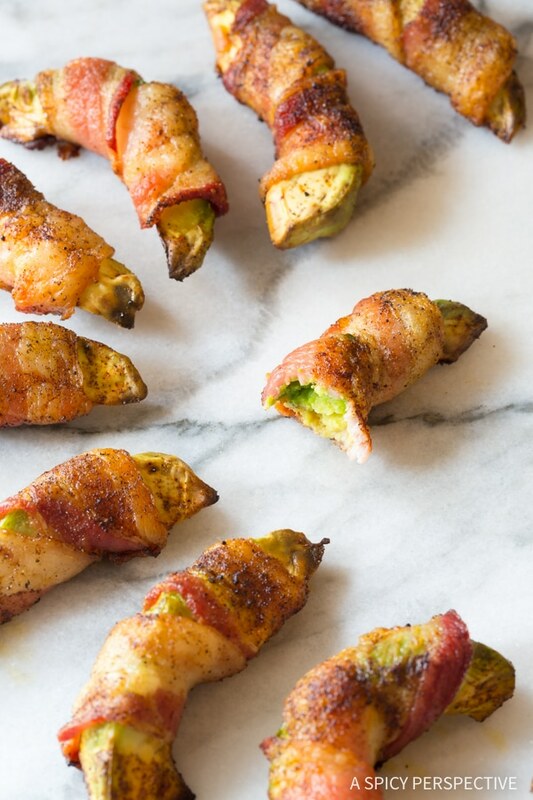 Bake the Bacon Wrapped Avocado slices until the bacon is red and crispy. 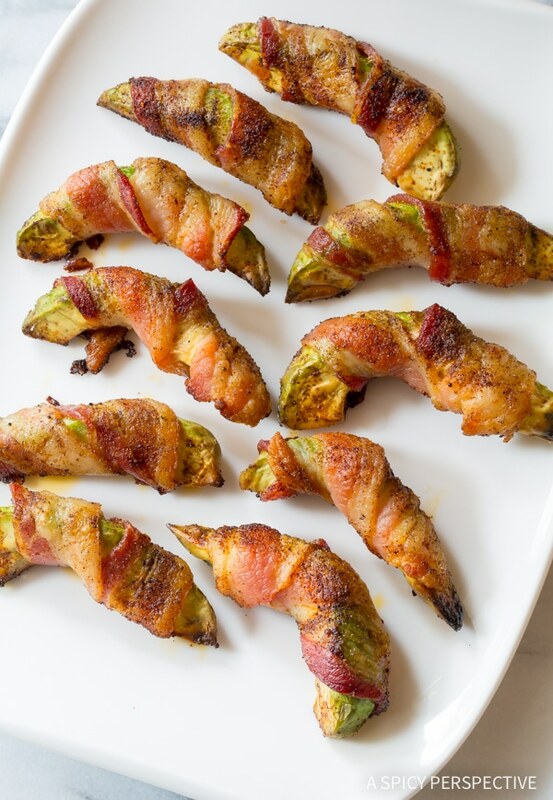 Bacon Wrapped Avocado tastes fabulous straight out of the oven, or at room temperature. This is a recipe you definitely have to try. 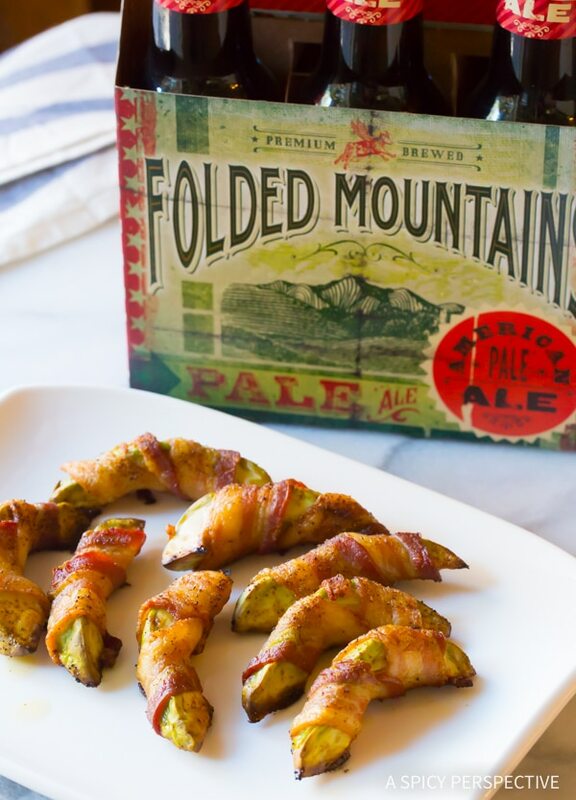 Make sure to pair them with ice cold Folded Mountain Pale Ale. You’re cutting so many carbs in the snack department, you deserve a frosty brew on game day! If you’ve never been to ALDI, or haven’t been in a while, give it a try! It’s a unique shopping experience designed to save you money. Find out more about the ALDI way here! Disclosure: This post is sponsored by ALDI. All opinions are my own. Bacon Wrapped Avocado Recipe - A fabulous low carb, gluten free, ketogenic, and paleo snack for parties! Made with just 2 main ingredients and a few spices! Preheat the oven to 450 degrees. Place a piece of parchment paper on a large rimmed baking sheet and set aside. Stretch the bacon to elongate the strips. Then cut them in half to create 16 shorter strips. Cut both avocados into 8 wedges each. Gently remove the peel. 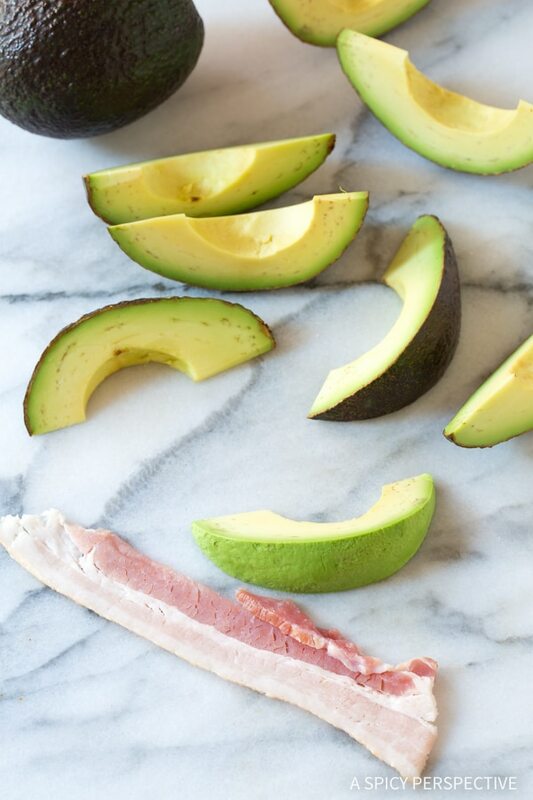 Wrap a piece of bacon around each avocado wedge, twice. Make sure you start wrapping on the under side, then end on the under side. 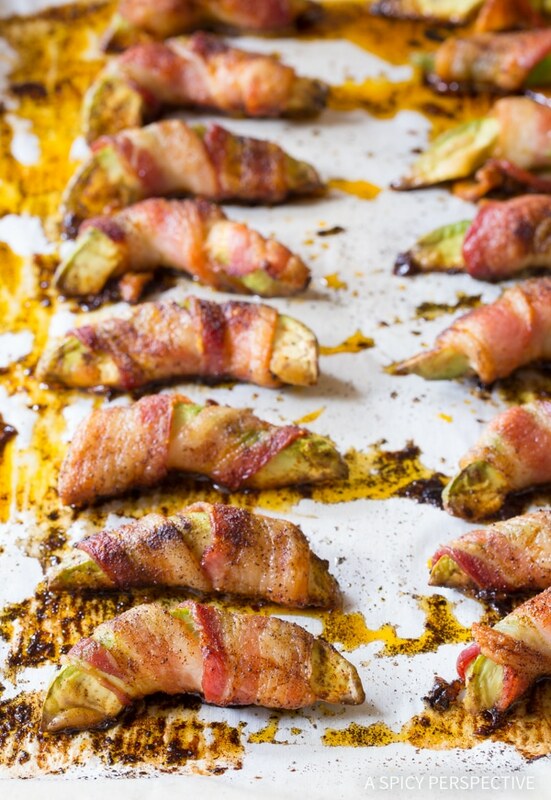 Lay the avocado wedges on the baking sheet with the bacon ends tucked underneath. Sprinkle the wedges lightly with ancho chile powder, cumin, and salt to taste. Bake for 15-20 minutes until the bacon is red and crisp. Cool on a paper towel lined plate to drain off the excess fat. Serve warm or at room temperature. Pair with Folded Mountain Pale Ale. 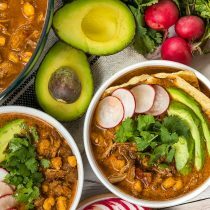 Pingback: The Ultimate Paleo Avocado Recipes Round Up! - Oh Snap! Let's Eat! 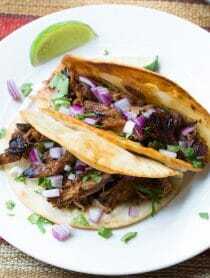 Super easy, quick and delicious! Trying new recipes for Keto and this is now a favorite! 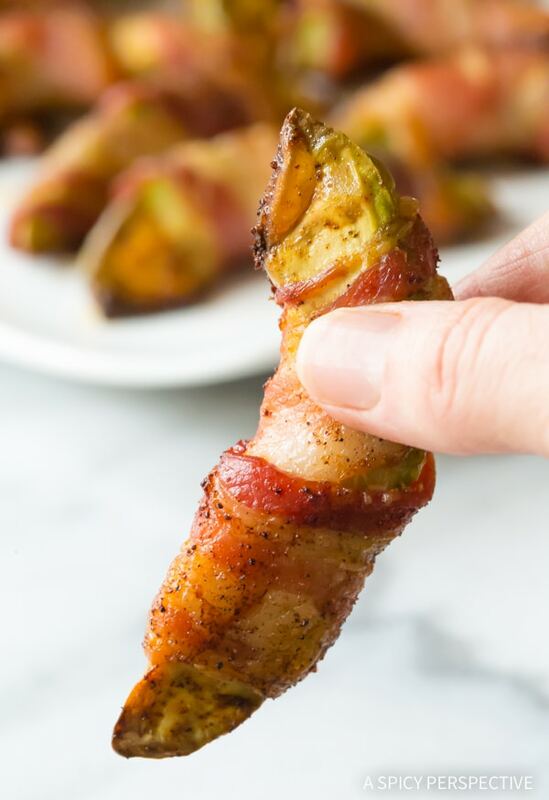 Pingback: Bacon Wrapped Avocado Bites – Simple, Quick and Easy Low-carb Snack! This is exactly how I want to eat my bacon and avocados!! These look so good. Two of my favorite things, avocados and bacon. 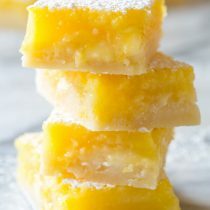 Totally making these for the big game and NOT sharing. 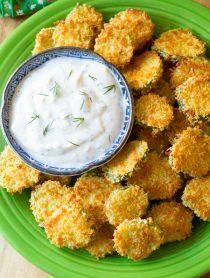 These look like the perfect appetizer – will have to try them for the next Super Bowl! I am making this for Superbowl Sunday! OMG that looks YUM! I am curious if you have any ideas for a dip to go with this? I’m thinking Chipotle dip? That sounds good! Good ol’ blue cheese would be nice as well. Perfect snack for game day! What perfect little appetizers! Love these!! 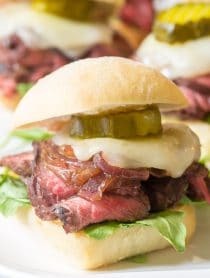 These look amazing – I have to try them this weekend!